Self Help, Inc. Launches “Holiday Joy” Toy & Food Donation Program - Self Help Inc.
Avon, MA, November 20, 2017 – Self Help, Inc., a non-profit that provides community action programs to serve families, individuals, and communities across southeastern Massachusetts since 196, has launched a toy and food drive just in time for the 2017 holiday season. 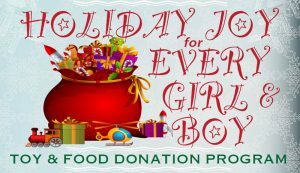 Under the theme, “Holiday Joy for Every Girl & Boy,” the program has a dual purpose of providing toys for low income or otherwise disadvantaged children in their service area, as well as helping assure that area families trying to overcome severe financial difficulties don’t have to go hungry during the holidays. Now through December 10, the organization is asking individuals, companies, and other groups to donate packaged, but unwrapped toys for both boys and girls age 3-to-6 at the donation centers they have set up in Avon, Attleboro, Norton, and two locations in Brockton. Street addresses of those centers can be found online at selfhelpinc.org/holidays. Mr. Carlson says they are also welcoming cash donations in lieu of toys. “If you don’t like to shop, our volunteers can take cash donations to go buy toys for the kids or food gift cards for the families. We’re thankful to have great volunteers, and you can donate knowing we are committed to getting those toys to the kids in time for the Holiday’s.” For Monetary donation please visit selfhelpinc.org/holidays and click on the donate button. Every year, Self Help Inc. serves over 15,000 households in 31 cities and towns within Bristol, Plymouth, and Norfolk counties. They provide programs and resources designed to allow people and families to overcome the tough times of real life so they can thrive.